Perhaps this card could be seen as Europe meets Australia (a bit like me!) with Europe represented by the Holly Embossing Folder and Australia by the colourful Christmas Bush. I'd like to thank my friend, Judy, for noticing and pointing out that the little floral image in the Hello Color stamp set looks a bit like Christmas Bush! 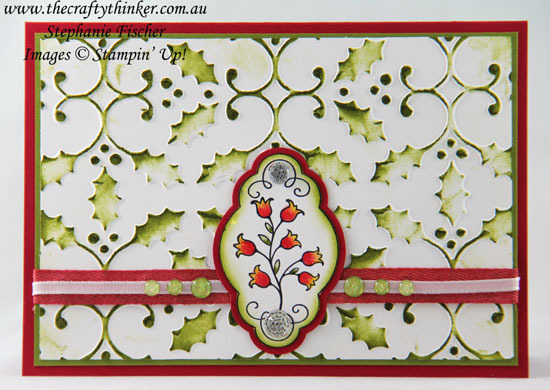 I stamped in Basic Black ink and coloured with Stampin' Write markers. I added the label image from the Label Me Pretty stamp set and then carefully fussy cut it before sponging Old Olive ink onto the edges. From Real Red cardstock I made a matching mat with the Pretty Label punch and added some Clear Faceted gems for Christmas bling. Lacking Real Red ribbon in my stash, I dyed a piece of Whisper classic Weave ribbon with Real Red ink and I added a piece of the Whisper White Sheer Ribbon. Once all the layers had been added to the Real Red base card, I added some Glitter Enamel Dots - because you can never have too much bling on a Christmas card!